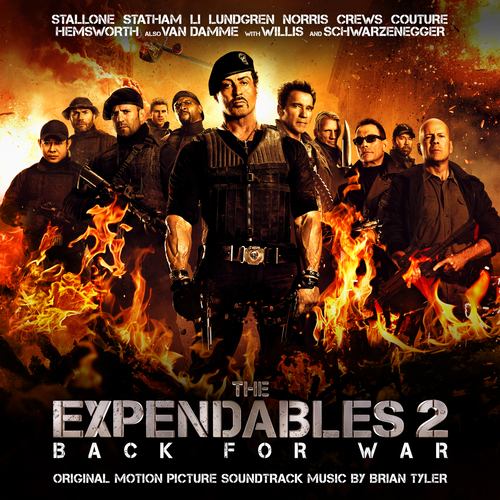 Composer Brian Tyler’s epic score to Director Simon West’s highly anticipated sequel. Starring Hollywood heavyweights Sylvester Stallone, Jason Statham, Bruce Willis, Arnold Schwarzenegger, Jet Li, Dolph Lundgren, Terry Crews, Randy Couture, Liam Hemsworth, martial arts experts Chuck Norris, Jean Claude Van Damme and Scott Adkins and Chinese actress Yu Nan as the first female Expendable. With Stallone's’s brief in mind, Brian Tyler created a score full of big contrasts. Brian Tyler is one of the most prolific creators of action scores in the business. In the last decade he has composed a wide selection of music for many films including Children Of Dune, Constantine, Annapolis, The Fast And The Furious, Aliens Vs Predator - Requiem and Battle Los Angeles. His previous releases on Silva Screen, Rambo (SILCD1260) and The Expendables (SILCD1339). “This time around, the heroes are more heroic and the villains are darker. The stakes are raised and the world’s survival hangs in the balance. That called for a more epic approach to the music which was recorded with an orchestra combined with world percussion and darker elements”. "Tyler's action fare is, as ever, superbly judged, mixing real thrills with some dramatic weight (Party Crashers, Track 'Em, Find 'Em, Kill 'Em) resulting in a score that is affectinately nostalgic and not riddled with cliche".